criminal justice | Stop Dog Whistle Racism! Following up on yesterday’s post, here is more from John McCain on his legal priorities and his courageous stance against bad guys. In a post for tomorrow’s National Law Journal, McCain writes that “Senator Obama’s judges would coddle criminals. I will appoint judges who will hold criminals accountable.” This is the same “I’m tough on crime” froth that McCain is spewing in his Florida fliers. McCain does say in the article that he would make it a priority to keep politics out of the Department of Justice – a worthy goal. Read his full post here. And read the Wall St. Journal’s analysis here. But the “coddling criminals” line is reminiscent of the Willie Horton ad credited with derailing Michael Dukakis in 1988. 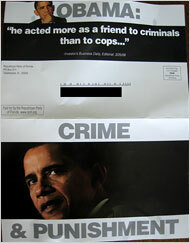 Floyd Brown, the same guy behind the Horton ad, launched a neo-Horton ad against Obama earlier this year (Brown’s National Campaign Fund PAC has also run ads alleging that Obama is a Muslim). And a YouTuber has taken it one step further in a video alleging that Obama could actually be Willie Horton. Some YouTube fun after the jump. Have you ever seen Obama and Horton in the same place at the same time? UPDATE: Braisted has some thoughts.